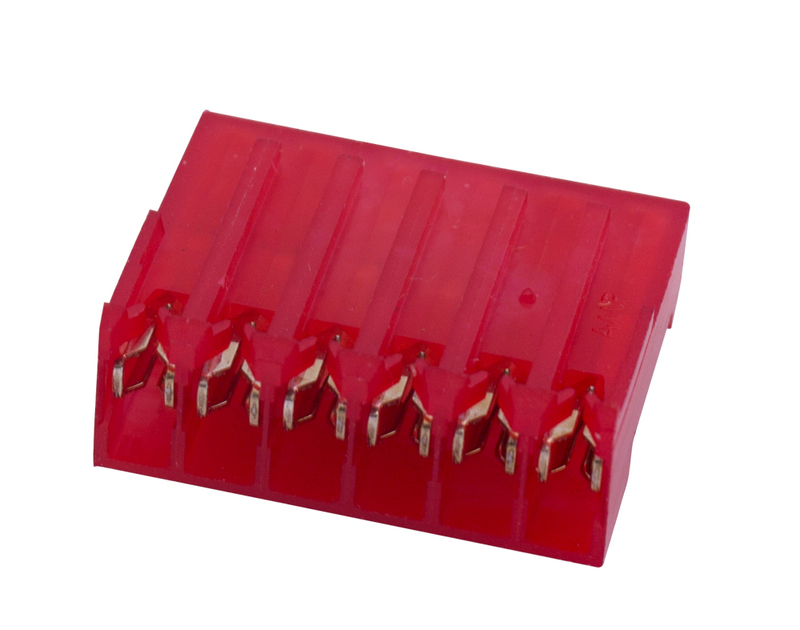 On Shore Technology 2 pin terminal block header. PCB mount. 15 amp. 5.08 mm. Terminal header connector. 2 pin. NSN: 5930-01-282-6008. Buchanan 5 pin header, mates with TSL-55B4P5S terminal strip. Allows PCB mounting. Flat terminal header. 5 Position. Gold terminal pins. 0.100" pitch. 0.025" x 0.024". 0.585" overall length. Low profile header socket. 5 pin. Gold contacts. 0.231" high (5.85mm). 0.100" pitch. Amp MTA 156 series connector. 6 position receptacle. Use with MTA headers. Accepts 22 AWG wire. 250v max. 5 amp. 0.156" pitch. DC: 88+. Samtec low profile male / female header set makes board stacking a snap. 6 pins, 8 positions. (less 2 pins for polarization - 1 way insertion). 0.100" pitch. 13/16" long. Sold as a set. Crane connector header. 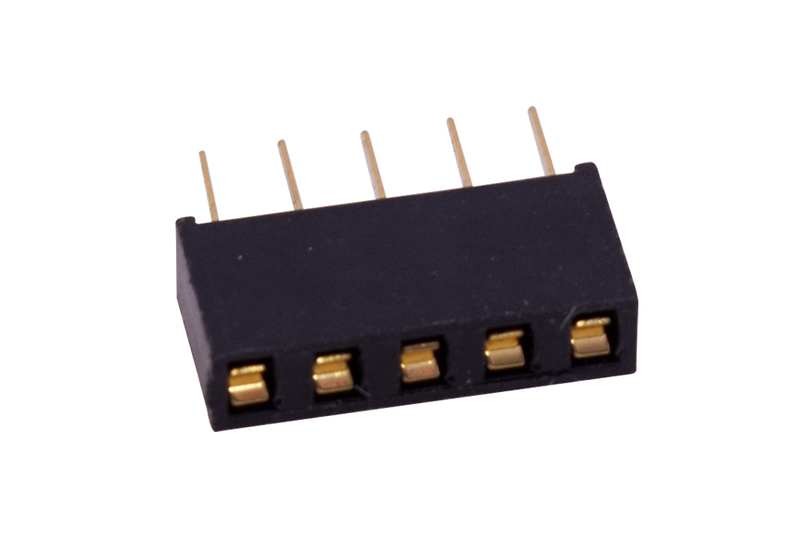 6 pin, surface mount. Full Mfg. P/N: GPEG06SS-TAS/P01,05. 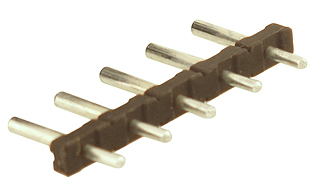 6 pin, right angle connector. Single row. 0.100 pitch. 110 vac, 5 amps, 130ºC. Not for interrupting current. 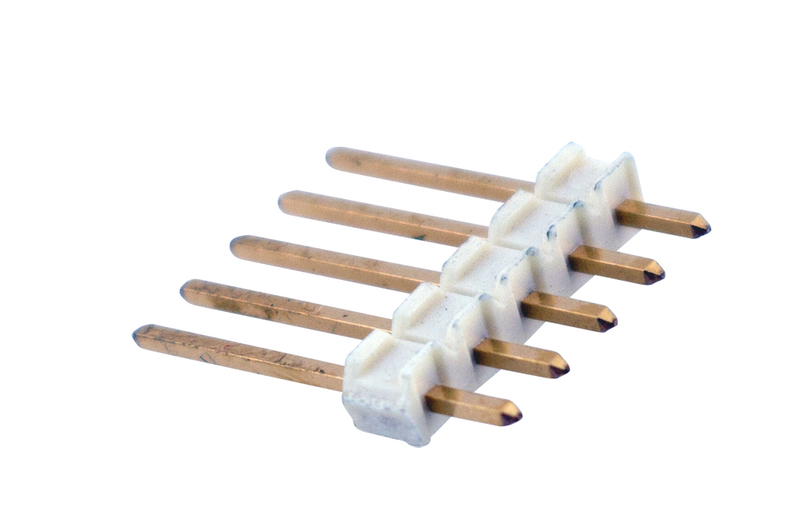 Samtec 6 conductor, board stacking interconnect strip. Gold. P/N: LBS-106-C-G-S. 1,100 available! Minimum order on this item is $1.00. Wire wrap terminal header. Gold. 7 position. 0.156" pitch. Pins: 0.031" x 0.060" x 0.989" overall. 0.242" x 1.063". NSN: 5999-01-004-2599. Flat terminal header. 8 position. Terminal blade: 0.031" x 0.060 x 0.65". 1.206" overall length. Panduit MAS-CON header. 9 pin. 300v. 105°C. 0.156" pitch. 3.96mm. Panduit MAS-CON end connectoer. 9 position. 0.156" pitch. 6.5 amp. Single row header. 12 pin. 0.156" pitch. 0.47" x 0.47" pins. 0.638" long. Fits (CPC) HDR12S.156 (right). Single row PC mount header socket. 12 pin. 0.156" pitch. Fits (CPC) 11-1-00103 (left). 1.871" x 0.253" x 0.449"H.
Samtec 12 Pin vertical surface mount header with locking clip. 1 row. Gold / Tin construction. 0.100" Pitch. 1-3/16" long. 1,100 available. P/N: TSM-112-02-L-SV-LC. Minimum order on this item is $1.00. Same as above but without locking clips. 3,500 available. Minimum order on this item is $1.00. Berg single row housing. 16 pin. No pins. 0.100" pitch. 1.589" x 0.547". DC: 1983. Samtec low profile strip, micro socket with hollow leg. 0.100" pitch. 17 conductor. 1-11/16" long. Gold. P/N: SL-117-G-12. 3,000 available. Ansley flex strip. 22 conductor. 0.1" conductor spacing. Remote mount a board or device. 3" long. 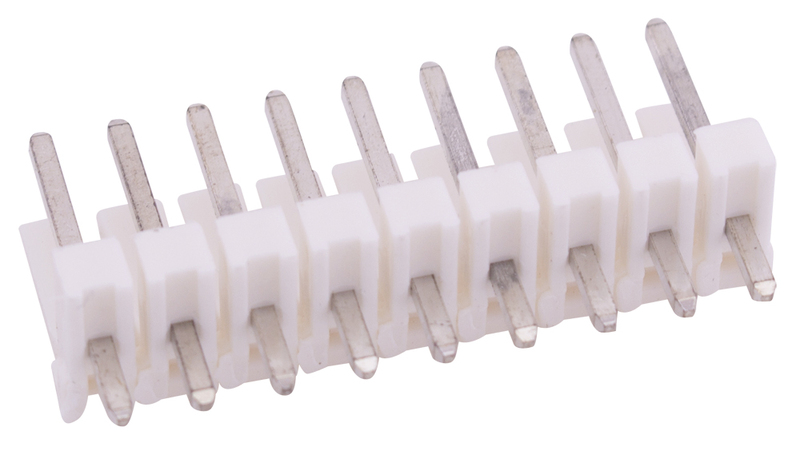 20 pin, single row angle header connector. 0.10" pitch. NSN: 5935-01-086-9357. Amp 20 pin horizontal PCB mount header connector. Dual inline female. End to end stackable. 0.100" pitch. (Model = AMPMODU Receptacle). P/N: 535512-2. 8,500 available!! Samtec 20 Pin connector header assembly with locking clip. 1 row. All tin construction. 0.100" Pitch. 2" long. P/N: TSM-120-01-T-SV-LC. Samtec 21 Pin dual body board stacker / vertical surface mount header. Gold / tin construction. 0.100" Pitch. 2" long, 3/4" high. P/N: HW-21-10-S-S-555-SM-LC. Samtec, 2 Pin connector header. Male. 0.100" Pitch. 64,600 available. Minimum order on this item is $1.00. Samtec, 4 Pin connector header. Male. 0.100" Pitch. 1,100 available. Minimum order on this item is $1.00. 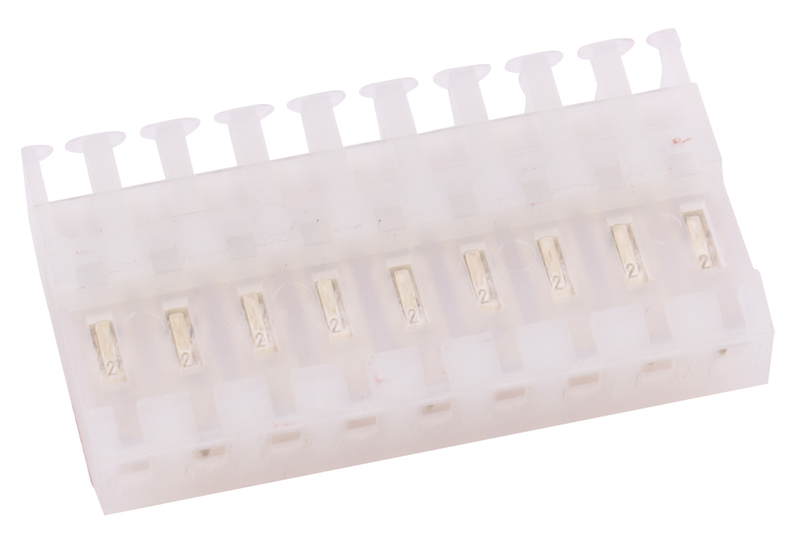 Samtec, 6 Pin connector header (pictured). Male. 0.100" Pitch. 1,300 available. Minimum order on this item is $1.00. Samtec, 20 Pin connector header. Male. 0.100" Pitch. 2,400 available. Amp, 24 Pin SIP connector header. Male. 0.100" Pitch. Samtec, 4 Pin surface mount horizontal unshrouded header with locking clips. Tin. Minimum order on this item is $1.00. Samtec, 5 Pin surface mount header. Tin. Otherwise, same as left. Minimum order on this item is $1.00. Samtec, 6 Pin surface mount header. Gold. Otherwise same as left. Samtec, 14 Pin surface mount header. Gold. Otherwise same as left. 2,000 available. Mill-Max double header connector. 26 pin. 2.6" long, 0.100" pitch. Mfg. P/N: 305-90-126-00-050000. 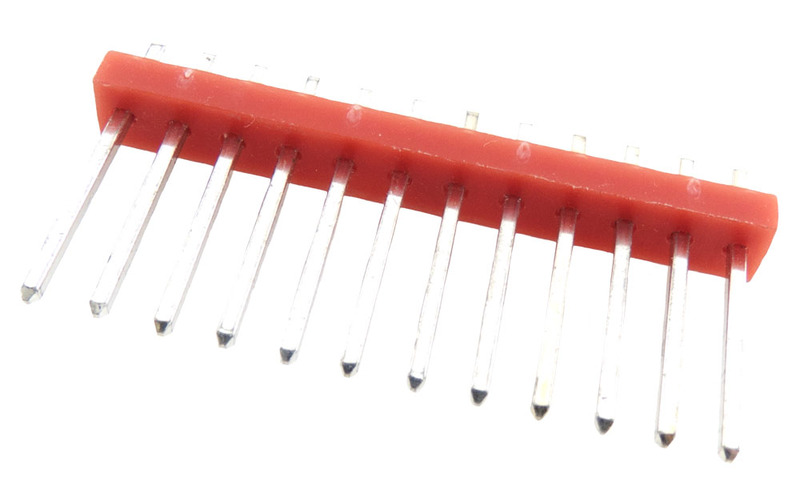 Sullins Electronics Corp. 36 pin SIP header. Tinned contacts. 0.25  square posts fit 0.040 [1.02] minimum diameter hole. Black thermo-plastic polyester. Phosphor bronze contact material. 125ºC continuous, 600 vdc, 3 amps, 5,000M ohms. 36 pin header connector, through hole. Gold / tin construction. 3.56" long, 0.100" pitch. 36 pin header connector, through hole. Gold. 0.100 pitch. 0.7" long pins. 3M connector / header / SIP. 3 position, female PCB. 0.100" pitch. 3M connector socket strip. 5 position, PCB. 8.26mm high x 12.7mm long x 2.54mm deep. 0.100" pitch. 3M socket strip. 10 position, female. 2.54mm, 0.100" pitch. Phoenix 16 pin header connector. 3.5mm PCB mount. 300v / 8 amp. Mill-Max machined pin socket strip header connector. 18 pin. 0.05"D pins. 0.100" pitch. Circuit Assembly Corp. socket strip. 15 position, PCB. 1.805" long, 0.100" pitch. 1.5"L.
Circuit Assembly Corp. socket strip. 18 position, PCB. 1.805" long, 0.100" pitch. Samtec machined pin socket strip. 26 pin female. Elevated single row. 0.100" (2.54mm) pitch. Continental 28 position round pin connector. Eyelet terminals. 0.156" pitch. 5" overall length. NSN: 5935-948-2830. Samtec SIP connector. Elevated socket. 36 pin. 2.54mm long, 0.100" pitch.